XT-Armor Oven Shield Reflow Oven & Wave Maintenance Coating is a water-based, environmentally friendly coating that is designed to protect PCB assembly equipment from flux residues adherence. Flux sticks to the coating surface and then peels off – drastically reducing maintenance time. 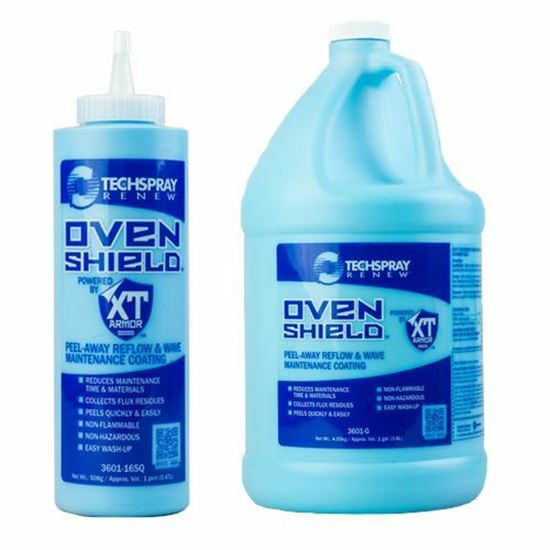 XT-Armor Oven Shield is an effective mask coating to protect oven surfaces between scheduled maintenances. Regular use of coating reduces maintenance labor, equipment down-time and cleaning consumables like wipes and chemicals. All these benefits increase available production time and reduce maintenance cost. XT-Armor Oven Shield, Reflow Oven & Wave Maintenance Coating has been tested and proven compatible with all of the most popular oven and wave equipment manufacturers: BTU, Heller, JTU, SMT, Speedline and Vitronics-Soltec. One gallon covers approximately 20 sq. ft.